Yes. Registration is at the race site in Ft. De Soto starting at 5:30 a.m.
What is the race refund policy? 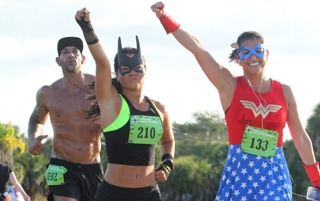 To receive a refund, transfer or credit, you must register by July 28, 2018 for the Florida Halloween Halfathon & 5K Race and notify the race director by e-mail (not Facebook) at least 3 weeks before the race or by October 7, 2018. There are no refunds due to cancellations due to an Act of God, such as weather. No deferral or transfer is available if you do not show up for the race. All refunds will be issued after the last race of the series (Shamrock Halfathon & 5K), on or about April 1, 2018. Can I transfer my bib to another runner? No. You may not give or sell your bib to another individual. The other individual will not be covered by USATF race insurance if there should be an injury. The other individual’s results may compromise scoring as they may be in a different age bracket than yourself. They will be disqualified. You and the other individual will be prohibited from running in our races for 3 years. How do Canadians and international runners register? Canadians may register online or by printing the entry form, with check payable in U.S. Dollars. All other international participants MUST register online using a major credit card. International participants requiring invitations to secure visas must request letter by September 1. You must include in your request your full mailing address as well as the address of the U.S. Consulate in your area. Letters of invitation will be sent by mail only. Athletes who register online receive immediate confirmation from Active.com. Mail-in registrations also get auto-confirmation once the information is entered into the system. What do I do if I cannot find my registration? Email us info@flroadraces.com. In the subject line please put “Missing Registration.” Be sure to include your first and last name that you registered under (maiden name, etc.). Please note, if you registered for the series (Challenge or Triple Crown) your name will not appear in the search results for the individual race. Do a search under the series that you registered for. Are there packet pickups before the race? Yes. There are 5 packet pickups before the race, as well as on race morning at Fort De Soto. Here’s the schedule. Can I register for the race at packet pickup? Yes, you can register for the race at packet pickup, even on race morning. We accept credit cards, cash & checks. If someone else picks up your race packet for you, they MUST have a copy of your confirmation sheet. Yes, there will be packet pickup at the race site starting at 5:30 a.m. to 6:45 a.m. Please come early so you have plenty of time to prepare for the start of the race. How do I get to Fort De Soto? Fort De Soto Park is located at the southern end of Pinellas County and easily accessible from any direction. From Interstate 275, watch for signs for the Bayway, which connects St. Petersburg and St. Pete Beach. Head west towards the beaches, turning south to Fort De Soto Park. From the beaches, head south to St. Pete Beach, turning left at the Don CeSar Beach Resort onto the Bayway, turning south to Fort De Soto Park. Once you reach Fort De Soto Park, turn right and follow the bend in the road to North Beach all the way at the road’s end. There is ample free parking at North Beach in Ft. De Soto Park. Do we have to pay the $5 parking fee? No. We have paid for you. Just drive right past the pay booth. Yes. The 5K and Half marathon courses are accurately measured and certified by the USATF. To view the course maps click here. Are the 5K and Half Marathons loop courses? Yes, both races start and finish at Ft. De Soto Park’s North Beach. The courses are extremely flat — parking lots, access roads, and paved recreational trails — an out-and-back tour of Fort De Soto Park. No, you will be running on paved recreational trails and access roads with the beach, dunes, or woods in sight. We require that runners and walkers be properly prepared and trained to finish the Halfathon within 4 hours (18 minute/mile pace). Please note that 4 hours after the start, course support ((i.e. aid/water stations, volunteers, course marshals, clocks, etc.) is not guaranteed. Are strollers, dogs or bicycles allowed on the course during the race? No. Since this is a USATF certified course, and due to insurance restrictions and liability concerns, only runners, joggers and walkers are allowed. Will you have aid stations and portalets on the course? There are 7 aid stations with water and Gatordade starting at about mile 2.2. Fresh Florida oranges will be available starting at aid station #2 (mile 4.5). There is a combination of permanent facilities and portalets available along the courses. Click here to see map. Yes, we have a fabulous post-race party including pasta, breakfast pastries, fruit, munchies and beer. There is live music for your entertainment. Will there be massage therapy at the race? Yes, sports massage therapists will have a tent set up and will provide massages for $10/12 minutes, $20/24 minutes. The massage therapists are all licensed by the Florida State Massage Therapy Association. Results will be posted at the Results page a few hours after the race. I have a question about my finishing time. Whom can I contact? For timing and scoring questions please e-mail us at info@FLroadraces.com. Our chief scorer will get back to you within 24 hours. The awards ceremony starts around 8:45 a.m for the 5K and soon thereafter for the halfathon. It is located at the races’ post-race party area. Halfathon Awards All Halfathon finishers receive a Halloween edition of our unique gold running starfish medals. 5K Awards All 5K finishers receive a Halloween edition of our unique gold running starfish medal. Is there a virtual run for this race? Yes. Please go the Virtual Runs page for information. Not at all. Please run in whatever you are comfortable in. However, if you wish to run in a costume. What are the categories for the Costume Contest? We have the best costumes at our race. Here are the categories. Thank you for your inquiry! Come be a part of the support system for your running community, and the out of towners who join us. Your time, energy and support are invaluable to all of us! Please go to the Volunteers page to sign up. What is the Volunteer Fundraising Opportunity? In an effort to give back to our community, we invite small groups to adopt an aid station during each of our races. Any non-profit group of eight volunteers will receive a post-race donation of $200. This is a fun way for running clubs, youth athletic teams, school groups, and other charities to participate in our community events while earning funds for your organization. If your group would like to participate, please register NOW! These are offered on a first-come basis and may fill up quickly. What charities are you affiliated with? Florida Road Races is a family-owned and operated business, with most of the revenue covering expenses, and hopefully some profit so we may continue to operate. Earning our living in this sport allows us to give back to our community in a variety of ways: 1) Unlike some other singular-cause events like “Komen Race for the Cure” where all the proceeds go to one non-profit, we donate cash to a number of local, micro non-profits such as running clubs, youth athletic teams, etc. that support our races with their volunteers. 2) We offer direct support to athletes in financial need through our Entry Fee Assistance program. We also invite local elite athletes to participate so they can continue to improve. 3) We encourage small non-profits to use our Clearwater 5K Walkathon as a fundraiser. In a nutshell, any non-profit that registers with us and recruits athletes to participate in the walk, receives $20 of the $30 entry fee. We have all the infrastructure, permits, etc. in place. All a non-profit needs to do is recruit its supporters. 4) We often provide comp entries as raffle items for auctions at churches, schools, fundraisers, etc., and we donate modest amounts of cash when our athletes are raising funds for their pet projects. 5) Through our races, we provide exposure to other fundraising events via Facebook post, emails, and our goody bags. 6) Our biggest area of charitable endeavor is to provide our race management services, equipment and time, pro bono or partial pro-bono, to non-profits that stage races. In prior years, we did this for the Partners For Life Police Appreciation Run. Recently, we helped the Celma Mastry Ovarian Cancer Foundation increase participation by 50% for its One Step Closer to the Cure 5K / 10K / 1 Miler. On September 27, we are helping a fellow race director stage her Sunrise Run. We also offer our time or equipment when applicable, such as volunteering at Gasparilla and the St. Pete Road Runners 5K Beach Series. 7) The absolute most satisfying charitable endeavor last season was to create and stage the “Tampa Bay for Boston Memorial Run.” Just about 3 weeks after the Boston Marathon bombing, we hosted 800 athletes in St. Pete for a candlelight vigil and memorial run, raising $15,000 for the victims through The One Fund Boston. As you can see, we LOVE being a part of the Tampa Bay running community and thoroughly enjoy being in a position where we can help in so many diverse ways. We don’t think we’ll ever have a hospital wing named after us, but we take great joy in helping people on a more direct, personal level.